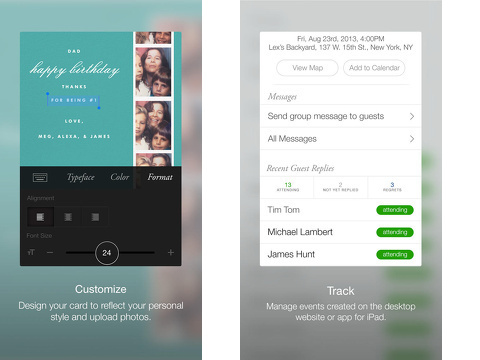 Create customized e-vites and e-cards with the Paperless Post iPhone, iPod Touch, and iPad app. The designs are fresh and contemporary, and the editing tools are simple. You customize your e-vites and e-cards, or you select from curated designs by Kate Spade, Kelly Wearstler, The New Yorker, and Jonathan Adler. The home screen has crisp graphics to embellish the categories. The selections include bridal showers, save the dates, birthday party, kids’ birthdays, birthday cards, photo greetings, just because, thank you notes, and baby showers. Seasonal events and holidays are also highlighted. You can also browse and filter by event type and color with taps on the appropriate icons in the upper right corner. You can explore the designs and play with the tools, but create an account first to save any edits. Accounts must use Facebook or email. If you select Facebook, you must allow permission to public profile, friend list, email, birthday, events, and photos, as well as all of these categories for your friends. You can opt out of posting on your timeline. The designs are fantastic, and the copy is witty. When you are ready to make an e-vite or e-card, you tap it. It expands in a new screen with editing tools in the bottom menu bar. The names of the tools do not have enough contrast, so they are hard to see and read. In a future update, hopefully, the names of the editing tools will be brighter and bolder. You tap the text to customize. You can use the exact sizes and layouts, or you can adjust using the tools at the bottom of the screen. You can select a different font and color from a large group of suggestions. You can adjust the font size, line height, and spacing with volume-style adjustments. You enter an e-mail to send it. It is sent in a digital version of a paper envelope. This free download from the iTunes App Store loads you with 30 coins to get started, and you earn additional coins with use. You may also make in-app purchases to send larger quantities of e-vites. Paperless Post iPad app is a great tool for businesses to incorporate into their marketing plan – particularly design and style enterprises. Paperless Post iPhone, iPod Touch, and iPad app creates a great experience for the recipient, but the editing tools need an adjustment to make it fantastic for senders. The quality of the e-vites and e-cards is strong, and the interface is solid. The contrast of the white copy and dark screen needs to be enhanced. 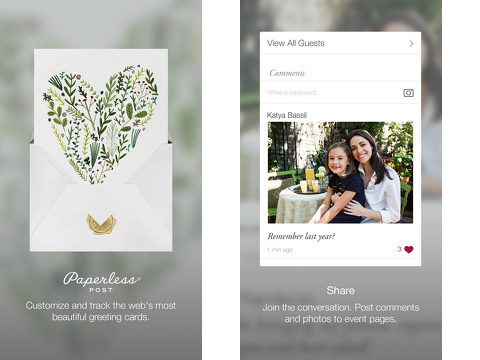 AppSafari review of Paperless Post — invitations, greeting cards, stationery, RSVP tracking, and ecards was written by Jenni Ward on March 7th, 2014 and categorized under App Store, Free, iPad apps, Productivity, Social, Universal. Page viewed 4452 times, 1 so far today. Need help on using these apps? Please read the Help Page.